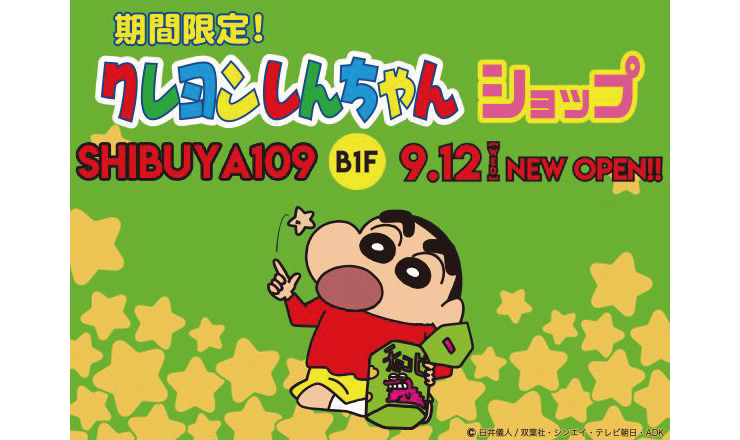 An official Crayon Shin-chan store is opened on floor B1F of Shibuya109 on September 12 for a limited time. Crayon Shin-chan is an internationally beloved franchise that has spawned manga, anime, movies and more. Fans can look forward to getting their hands on exclusive items of their favourite character at the new shop. There are currently three permanent Crayon Shin-chan shops located along Tokyo Character Street at Tokyo Station Ichibangai, at HEP FIVE in Umeda, Osaka, and at S-PAL Sendai. Crayon Shin-chan pop-up shops are also opening across Japan like the one arriving at Shibuya109. Look forward to a line-up of merchandise with cute deisngs including fashion items, snacks perfect for souvenirs and more, as well as a range of popular items from the permanent stores. If you’re in Shibuya in September, October or November then why not stop by?